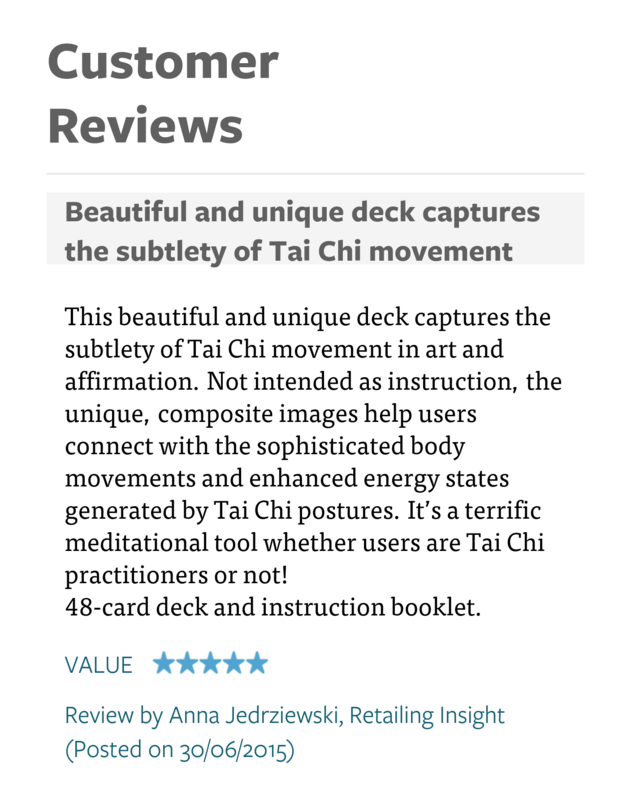 I was asked to write a short article to accompany the release of the Tai Chi Reflections cards and I thought I would repost that here. I believe that the cards have arrived with most distributors now and so if you have made a preorder then the cards should be with you very soon. The mobile app, by the way, for all platforms is also almost completed (more of that later). Tai Chi is a martial art, and despite the beauty and grace of its movements and its apparent serenity, its genesis is a combat system. When I started to learn Tai Chi many years ago, it was the inner grace and serenity and the meditative qualities that attracted me and so it was a surprise to me to learn that some people consider it to be one of the most deadly of the martial arts. My tutor was indeed a very physical man and he always impressed upon me that the martial aspects were important; that every position, even if it was an inward or receptive ‘Yin’ movement, was still a position of strength. Most people who take up the study of the form will rarely, if ever, apply these skills in this way but nevertheless this is the power that you are developing and becoming sensitive to as you learn the art. Most people will know of Yin and Yang energy – the feminine, receptive, inward principle of the Yin and the masculine, active and outward principle of the Yang; and these are, of course, not meant to be restricted in their use to men and women separately. We are each balancing these energies all the time in our everyday lives. This is how we get along. How we relate to each other. We are sometimes active, sometimes passive, sometimes forceful and sometime compromising. If we do not know how to balance these energies and embrace them all, then in certain situations we might find it hard to get along with people. We may find it hard to assert ourselves or conversely assert ourselves too much resulting in conflict. A tutor I had in Bangkok a few years ago put his first priority in simply learning how to stand with strength and stability. As I see it – how to ‘stand up for yourself’ – to not be a ‘pushover’ and to ‘take a stand’ with who you are. This is very real and simple, down to earth self-empowerment from our normal language and it is this that interests me and I have tried to present in these cards. With the deck I invite the user to choose a card at random and to concentrate on that posture, to adopt the posture for themselves and to feel how it affects (and effects) them. Let me take a couple of examples from the cards to illustrate what I mean about this… and let me add that of course these are only 48 snapshots from what is a continuous flowing movement and so there is so much more for you to discover for yourself if you do take up your own study. I’d like to look at the FOCUS card. Here we see the model posed in the form of an archer who has drawn the bow. The weight is evenly balanced between the two feet here, knees slightly bent – a very stable position. The gaze is directed intensely at the target, the bow is tightly drawn and the potential energy is at its maximum. Try it now… if you have in mind a particular goal and imagine that as your target, as soon as you stand firm and draw that imaginary bow, you will undoubtedly feel the power of your accuracy and intention to hit that target; and moreover the people around you will undoubtedly feel the strength of your intention too. The text on the reverse of this card reads ‘Draw the bow, become the target, release the arrow’. Positive thought and strength all wrapped up in one simple posture. Perhaps a more contemplative card is the CYCLES card: – The tai chi form is full of circular motions as the outward and inward motions naturally move from Yin to Yang and back again. The idea of ‘holding the ball’ may be familiar to tai chi students as it is a good way to learn the movements and to visualize the cycle of change. Life is change, nothing remains same from moment to moment and each of those moments is in its rightful place. The text for this card reads ‘Cycles of life endlessly turning and returning us to the source’. Be stable at the centre of your own universe. My approach is perhaps not a conventional one, but if you learn tai chi, which is what I would love you to do, you will become strong, you will become stable and you will be self-empowered. These cards are meant to encourage you to become that, and to find your own individual way. The Tai Chi Reflections cards are not a teaching – they are intended to be an enquiry into yourself. This entry was posted in Uncategorized and tagged self empowerment, tai chi, tai chi chuan, taichireflections on August 11, 2015 by richardcrookes. You can now order the cards from Findhorn press or Amazon. This entry was posted in Uncategorized and tagged Richard Crookes, tai chi, tai chi chuan, tai chi reflections, taichireflections on August 5, 2015 by richardcrookes.